It is a model of leadership, an example more leaders should follow — though too few do. It’s one more example of the high caliber leadership Dwight Eisenhower demonstrated throughout his life. In its imperfections, handwritten, it should take your breath away. Eisenhower was a leader down to the bone. So again, today, on the 74th anniversary of the D-Day invasion, we remember. This quote actually isn’t a quote. It was never said by the man who wrote it down to say it. It carries a powerful lesson because of what it is. In preparing for the D-Day invasion, Supreme Allied Commander Dwight Eisenhower carefully contemplated what would happen if the invasion failed. What if the Germans repulsed the Allies, and no foothold was established to re-take the main body of Europe from the Germans? Ike’s answer is a model of leadership: He would take the blame. Regardless what happened, Ike took full responsibility for the failure, giving credit to the soldiers who would have sacrificed in vain, perhaps their lives. The Bathtub recently posted Gen. Dwight Eisenhower’s “order of the day” to the troops about to conduct the Allied invasion of Normandy — D-Day — to establish the toehold in Europe the Allies needed to march to Berlin, and to end World War II in Europe. As a charge to the troops, it was okay — Eisenhower-style words, not Churchill-style, but effective enough. One measure of its effectiveness was the success of the invasion, which established the toe-hold from which the assaults on the Third Reich were made. Photo shows Eisenhower meeting with troops of the 101st Airborne Division, 502nd Parachute Infantry Regiment, on the eve of the invasion. It was these men whose courage he lauded. When Eisenhower wrote his words of encouragement to the troops, and especially after he visited with some of the troops, he worried about the success of the operation. It was a great gamble. Many of the things the Allies needed to go right — like weather — had gone wrong. Victory was not assured. Defeat strode the beaches of Normandy waiting to drive the Allies back into the water, to die. Eisenhower wrote a second statement, a shorter one. This one was directed to the world. It assumed the assault had failed. In a few short sentences, Eisenhower commended the courage and commitment of the troops who, he wrote, had done all they could. The invasion was a chance, a good chance based on the best intelligence the Allies had, Eisenhower wrote. But it had failed. The failure, Eisenhower wrote, was not the fault of the troops, but was entirely Eisenhower’s. He didn’t blame the weather, though he could have. He didn’t blame fatigue of the troops, though they were tired, some simply from drilling, many from war. He didn’t blame the superior field position of the Germans, though the Germans clearly had the upper hand. He didn’t blame the almost-bizarre attempts to use technology that look almost clownish in retrospect — the gliders that carried troops behind the lines, sometimes too far, sometimes killing the pilots when the gliders’ cargo shifted on landing; the flotation devices that were supposed to float tanks to the beaches to provide cover for the troops (but which failed, drowning the tank crews and leaving the foot soldiers on their own); the bombing of the forts and pillboxes on the beaches, which failed because the bombers could not see their targets through the clouds. There may have been a plan B, but in the event of failure, Eisenhower was prepared to establish who was accountable, whose head should roll if anyone’s should. Who in the U.S. command would write such a thing today? Who else in history would have written such a thing? Is there any indication that Julius Caesar, Alexander the Great, Attila the Hun, Genghis Khan, or any other commander of a great army in a world-turning invasion, considered how to save and perhaps salve the reputation of his troops, though they had failed? Leadership is more than just positive thinking. The message may also be viewed here. Yes, it’s incorrectly dated July 5 — should have been June 5. In history, little is perfect. We can excuse his slip of the pen, considering what else he had on his mind. It is a model of leadership, an example more leaders should follow — though few do. It’s one more example of the high caliber leadership Dwight Eisenhower demonstrated throughout his life. In it’s imperfections, handwritten, it should take your breath away. Eisenhower was a leader down to the bone. So again, today, on the 71st anniversary of the D-Day invasion, we remember. It is a model of leadership, an example more leaders should follow — though few do. It’s one more example of the high caliber leadership Dwight Eisenhower demonstrated throughout his life. In it’s imperfections, handwritten, it should take your breath away. So again, today, on the 70th anniversary of the D-Day invasion, we remember. The message may also be viewed here. Yes, it’s incorrectly dated July 5 — should have been June 5. In history, little is perfect. We can excuse his slip of the pen, considering what he had on his mind. This is much of an encore post. 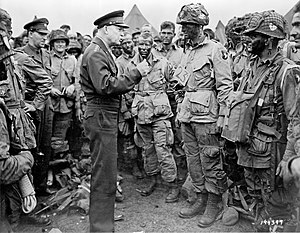 Yesterday I posted Gen. Dwight Eisenhower’s “order of the day” to the troops about to conduct the Allied invasion of Normandy — D-Day — to establish the toehold in Europe the Allies needed to march to Berlin, and to end World War II in Europe. As a charge to the troops, it was okay — Eisenhower-style words, not Churchill-style, but effective enough. One measure of its effectiveness was the success of the invasion, which established the toe-hold from which the assaults on the Third Reich were made. Who in the U.S. command would write such a thing today? The message may also be viewed here. Yes, it’s incorrectly dated July 5 — should have been June 5. This mostly an encore post. 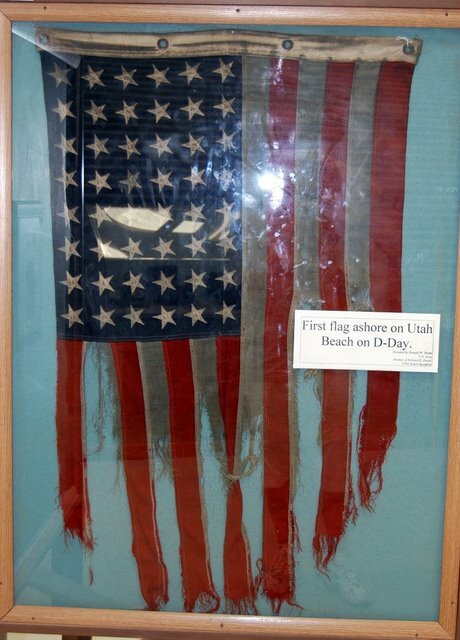 A reader sent an e-mail with a question: Does U.S. law suggest the flying of the U.S. flag on the anniversary of D-Day? Today is the 66th anniversary of the Invasion of Normandy in World War II, a date generally called D-Day. No, you don’t have to fly your flag. This is not one of the days designated by Congress for flag-flying. But you may, and probably, you should fly your flag. If you have any D-Day veterans in your town, they will be grateful, as will their spouses, children, widows and survivors. A 22-year-old soldier on the beach in 1944 would be 87 today, if alive. These men and their memories of history fade increasingly fast. Put your flag up. You may be surprised at the reaction. If you do run into a D-Day veteran, ask him about it. Keep a record of what he says. "First Wave at Omaha: The Ordeal of the Blue and the Gray" by Ken Riley: Behind them was a great invasion armada and the powerful sinews of war. But in the first wave of assault troops of the 29th (Blue and Gray) Infantry Division, it was four rifle companies landing on a hostile shore at H-hour, D-Day -- 6:30 a.m., on June 6, 1944. The long-awaited liberation of France was underway. After long months in England, National Guardsmen from Virginia, Maryland and the District of Columbia found themselves in the vanguard of the Allied attack. In those early hours on the fire-swept beach the 116th Infantry Combat Team, the old Stonewall Brigade of Virginia, clawed its way through Les Moulins draw toward its objective, Vierville-sur-Mer. It was during the movement from Les Moulins that the battered but gallant 2d Battalion broke loose from the beach, clambered over the embankment, and a small party, led by the battalion commander, fought its way to a farmhouse which became its first Command post in France. The 116th suffered more than 800 casualties this day -- a day which will long be remembered as the beginning of the Allies' "Great Crusade" to rekindle the lamp of liberty and freedom on the continent of Europe. Image from National Guard Heritage series, from which the caption was borrowed. Soldiers, Sailors, and Airmen of the Allied Expeditionary Force: You are about to embark upon the Great Crusade, toward which we have striven these many months. The eyes of the world are upon you. Be sure to check out the follow-up post, on the exigency message Ike didn’t have to use. In the first of the 2008 debates between presidential candidates, Sen. John McCain pointed to Gen. Dwight Eisenhower’s two letters, written on the eve of the D-Day invasion in June 1944. One letter would be released. The first letter, the “Orders of the Day,” commended the troops for their work in the impending invasion, giving full credit for the hoped-for success of the operation to the men and women who would make it work. In a few short sentences, Eisenhower commended the courage and commitment of the troops who, he wrote, had done all they could. The invasion was a chance, a good chance based on the best intelligence the Allies had, Eisenhower wrote. But it had failed. He didn’t blame the weather, though he could have. He didn’t blame fatigue of the troops, though they were tired, some simply from drilling, many from war. He didn’t blame the superior field position of the Germans, though the Germans clearly had the upper hand. He didn’t blame the almost-bizarre attempts to use technology that look almost clownish in retrospect — the gliders that carried troops behind the lines, the flotation devices that were supposed to float tanks to the beaches to provide cover for the troops (but which failed, drowning the tank crews and leaving the foot soldiers on their own). It was a case of the Supreme Commander, Allied Forces, taking upon himself all responsibility for failure. McCain has called for the resignation of the chairman of the Securities and Exchange Commission, which he points to as part of his plan for accountability. The analogy fails, I think. The proper analogy would be George Bush taking blame for the current financial crisis. In his speech earlier this week, Bush blamed homebuyers, mortgage writers, bankers and financiers. If Bush took any part of the blame himself, I missed it. I wonder if McCain really understands the Eisenhower story. I still wonder: Who in the U.S. command would write such a thing today?